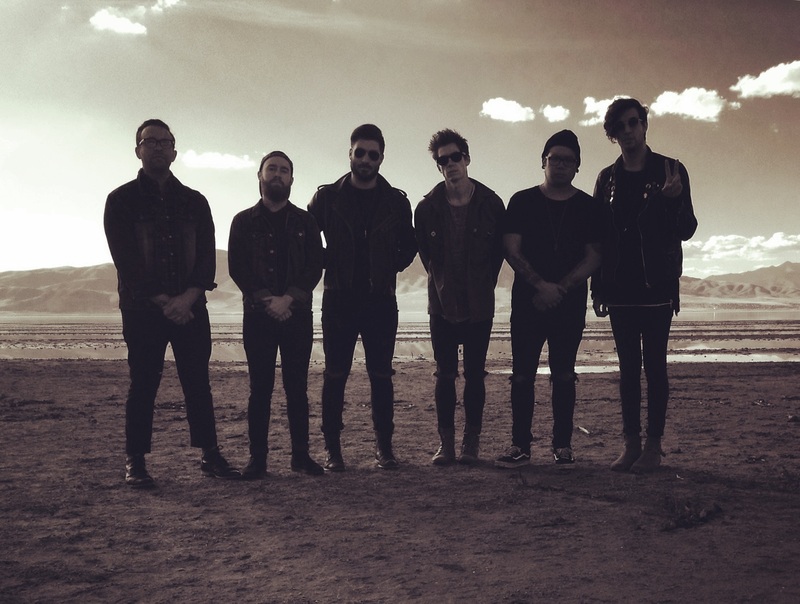 Young Rising Sons is an alternative rock band from Red Bank, New Jersey who signed to Interscope Records in 2014. With label mates such as Eminem, U2 and Lady Gaga, the Sons have a lot to live up to. 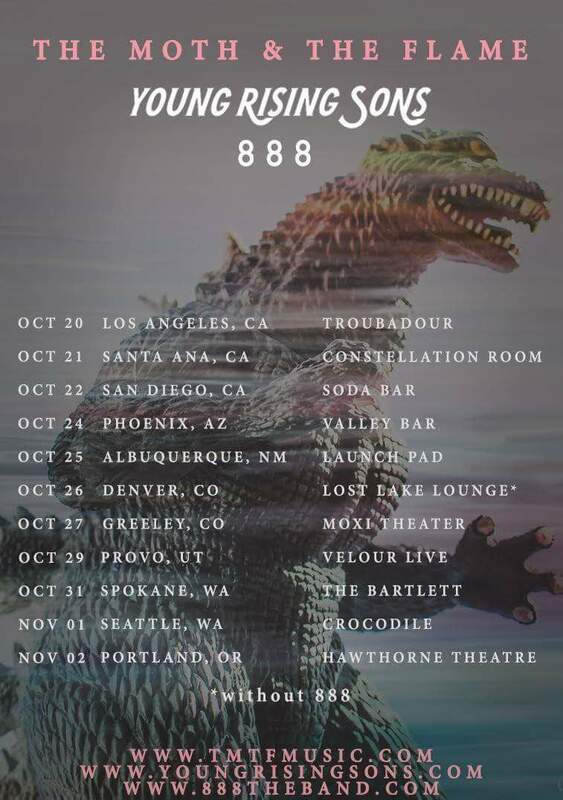 I was fortunate enough to spend ten days on the road with them in October 2016 as they embarked upon a west coast tour with The Moth & The Flame and 888 and what I witnessed each night was no less than spectacular. I saw a group of guys who are passionate, driven, and most of all, talented. The energy that they exuded on stage each night was infectious, and song after song found me dancing backstage, singing along to every catchy melody. While the band’s music and live show impressed me, what captivated me the most was their attention to fans. 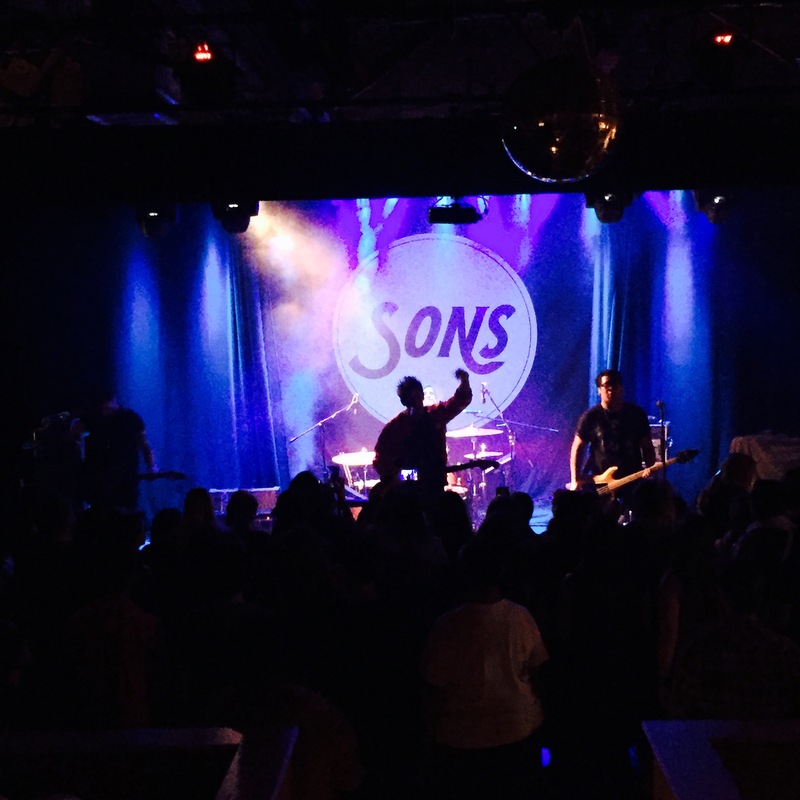 The Sons family is widespread and far-reaching, and there was definitely a sense of kinship as fans lined up for pictures and autographs at the end of each concert every night. I heard stories of how the band’s songs helped people get through hard times, overcome their fears, and pursue their passions. I saw fans young and old come together to scream the words that reached into the very depths of their souls. As an outsider looking in, it was obvious to me that the Sons have something special. I land in Santa Ana, California and take a scenic drive north to West Hollywood. Upon arriving at the venue, I reunite with tour manager Stephen Goldstein and the Sons, whom I haven’t seen since they toured with The Kooks in 2015. I begin setting up drums and a guitar station side stage where I’ll be tuning and changing guitars for the band’s set each night. The show goes off without a hitch and I spend the rest of the evening hustling CDs of the band’s latest EP “Undefeatable + 2,” which contains their most recent single, a cover, and an acoustic tune. Bass player Julian Dimagiba’s birthday lands at midnight and we spend the rest of the night celebrating at a lounge on Santa Monica Beach. It feels good to be back in California. After taking a morning stroll to shoot photos of the infamous Hollywood sign, I make my way to In-N-Out Burger for some lunch. It’s not as good as I remember. I meet the band at Guitar Center where we gear up for the next run of shows. This will be a recurring chore as the band members require new drumsticks, guitar pics, cables and tuners on an almost every-other-day basis. As we arrive at the venue, we realize that it is actually several venues in one. In the parking lot, a stage is being built for Bon Iver to play the next evening. Next door to our show is Taking Back Sunday, whom I have the pleasure of watching on and off throughout the night. Then there’s our room, which is a mid-sized venue and finally another outdoor space that seems to double as a sand volleyball court. Very punk rock. This evening I actually have time to watch 888 and The Moth & The Flame perform and am blown away by the high standard of musicianship which I will be surrounded by over the next couple of weeks. After waking up on a stranger’s floor due to an old Russian woman pushing an empty shopping cart outside of my window, I get an awesome home-cooked meal and have a chance to take in the scenery. The band and I depart for the next show which is 21+, so the Sons decide to put on an impromptu acoustic set in the park for their underage fans. At the drop of a tweet, a slew of kids show up and the band again proves their dedication to the Sons family as they spend almost two hours performing, taking photos, and signing autographs for everyone who came out. As we make our way to the venue, we fall into the similar routine of unloading, setting up, sound-checking, tearing down, setting up again, performing, tearing down, and loading up for the final time each evening. This is beginning to feel like work. I try my best to get up early and catch a ride to the beach. This will be my last day on the coast before we head into the desolate interior of the American southwest. I make it to South Mission Beach and hike out onto a rock pier where I spend way too much time taking selfies and trying to figure out where that seal sound is coming from. On an off-day like today, we spend seven-plus hours driving through the desert in order to make it to Phoenix for the next day’s show. 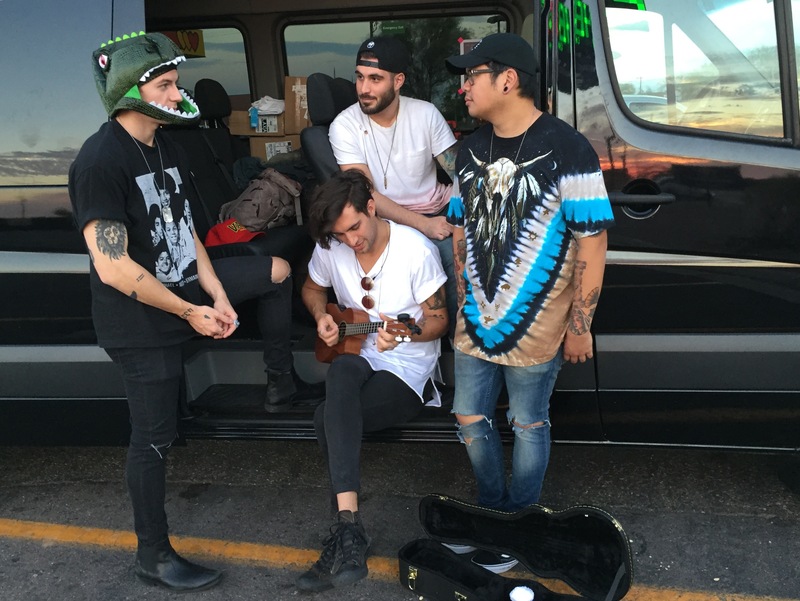 Van time is bonding time and after only four days in, I’m beginning to feel like a member of the Sons family. Because the guys in Young Rising Sons are the biggest sweethearts you’ll ever meet, they put on yet another free acoustic concert for their fans under 21 which takes place a few blocks away from the venue in a beautiful downtown green space. We do another meet and greet and learn that one of the fans had also been at the Los Angeles show just a few days prior. He is one half of the Linford Twins, who covered Young Rising Sons’ “King of the World” for a reality television show competition. The show at the venue goes well, but we get most excited about the amazing kale salad that the venue provides us for dinner. It’s the little things that count on the road, and eating healthy is one of them. After packing up and having fourthmeal at a creepy, haunted, baby-doll infested former warehouse, we make it to our hotel in Flagstaff, AZ. The curious thing about traveling is noticing when the weather changes. Though it was nearly 100 degrees during the day, by the time we arrive and get out of the van, it’s only 49 degrees. Arizona is a strange place. 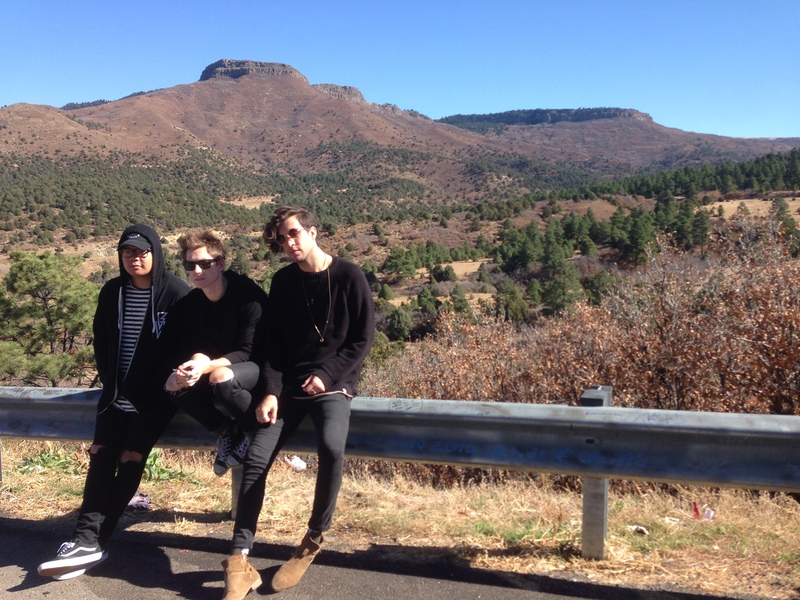 We wake up early and start making the scenic drive toward Albuquerque. This is one of the most beautiful drives as we see mountains, trains, rock formations, desert, and a guy driving a pick-up truck down the freeway without a tailgate, leaving his two dogs chained to the back of the bed. There’s not much else to say about New Mexico. Denver is a beautiful place. I wander around the city with touring guitarist Max Dean, who is possibly one of the greatest guys I’ve ever met. He decides to get a spontaneous tattoo and within 15 minutes he’s got fresh ink, the word “adventure” penned into his forearm. As we walk back to the venue, we pop into a guitar repair shop where the owner gives Max some free gear to repair his guitar. Max loves Denver. The band does a photo shoot in the alley behind the venue with an amazing photographer named Nikolai Puc whose creativity astounds us. You can check out his work here. As always, the band plays an amazing set with the aid of front-of-house engineer Shane Vetter, who has become a mentor to everyone on the tour. After the show, we pack up and return to our hotel, but that doesn’t last long. Before we know it, we are back at Denny’s for the third or fourth time this week. I am sick of Denny’s. Greeley is an interesting town. It was founded during the gold rush and even once housed German POWs during WWII. Everything about it screams “wild, wild west,” and as we are eating veggie burgers at an old saloon, a picture frame mysteriously flies off the wall. This town is probably haunted. One of the more unique venues on the tour, the Moxi Theater turns out to be a blast. An old theater perched on the second floor, the space is large, inviting, and just kitschy enough to be cool. This is, in my opinion, one of the most fun nights on the tour. Marissa of Ares Exposures takes a load of fun photos backstage which can be viewed here. The Sons wake up early to shoot a video for “Undefeatable” at the Decibel Garden, a recording studio space at The Lot @ RiNo, a multi-media collective based in Denver. 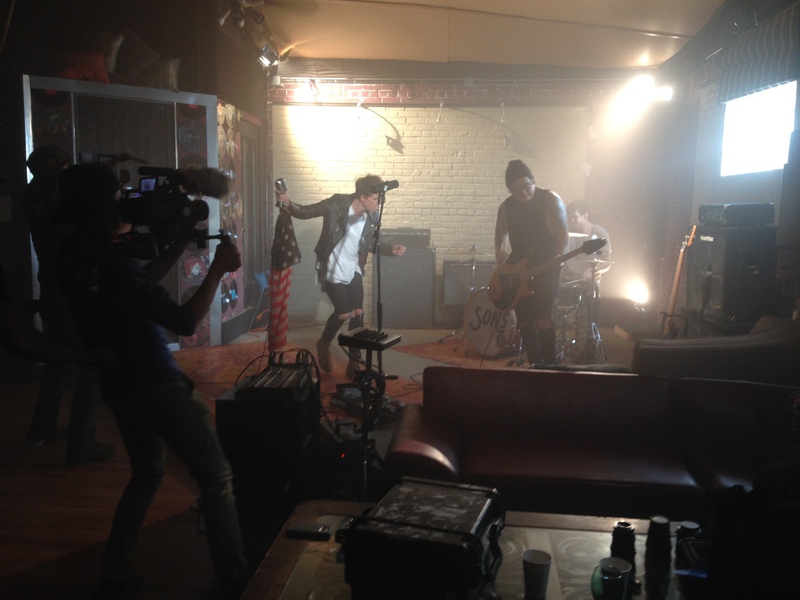 The video shoot could not have been more fun and inspiring as all of the staff were professional, creative and kind. A restaurant in Denver called Illegal Pete’s curates a “starving artist” program where they feed touring bands, but we fail to get a voucher on time. We go to Illegal Pete’s anyway and have some amazing Mexican food before we make our way to Utah. Driving through the night, we catch glimpses of beauty through a desert rainstorm as we pass out-of-this-world rock formations and scenery. I earn five good samaritan points by letting a stranger in a broken-down truck at the rest area use my cell phone. After over eight hours, we finally make it to our hotel in Utah. Velour Live in Provo takes the cake for the most interesting venue on this tour. Provo is another town founded in the mid-1800s and the interior of the venue is decorated as such. As this is my last night on the tour, I make sure to take it all in one last time; watching 888 and their creative live show, singing along with the Sons and enjoying my time as their tech, and watching The Moth & The Flame play to a sold-out crowd in their hometown. The boys drop me off at a Sheraton in the middle of the night in Salt Lake City and I could not be more devastated. After spending ten days crammed into a Sprinter van with these guys, it feels more like leaving home than going home. I’m looking forward to the next adventure.